Teledyne Optech's Multi-spectral LiDAR Sensor, ALTM Titan, the first airborne multispectral LiDAR sensor in the world, earned the 2015 Grand Award in the 9th Annual MAPPS Geospatial Products and Services Excellence Awards. From left to right: John Palatiello, MAPPS Executive Director; Jim Green; Mike Sitar and Michel Stanier of Optech Teledyne. In a ceremony held Tuesday at the Green Valley Ranch in Henderson, NV, Teledyne was presented awards in the Technology Innovation category, as well as the Grand Award. The new LiDAR sensor impressed the judges with Titan's ease in handling complex scenarios such as acquiring three wavelengths simultaneously; incorporating a metric camera imbedded in the system; creating a sensor that fits in a 16" gyro-stabilized mount; and increasing the depth penetration of the bathymetric sensor. To achieve this, Vaughan, Ontario-based Teledyne Optech had to develop new fiber lasers and a triple wavelength receiver which allowed for the collection of bathymetric LiDAR, topographic LiDAR and multispectral LiDAR in one single sensor. "Teledyne Optech's ALTM Titan is a marvel in LiDAR engineering," said Robert "Bob" Burtch PS, CP, Professor Emeritus at Ferris State University in Big Rapids, Michigan, and chairman of the panel of judges. "This development allows the collection of bathymetric LiDAR, topographic LiDAR and multispectral LiDAR in one single sensor." 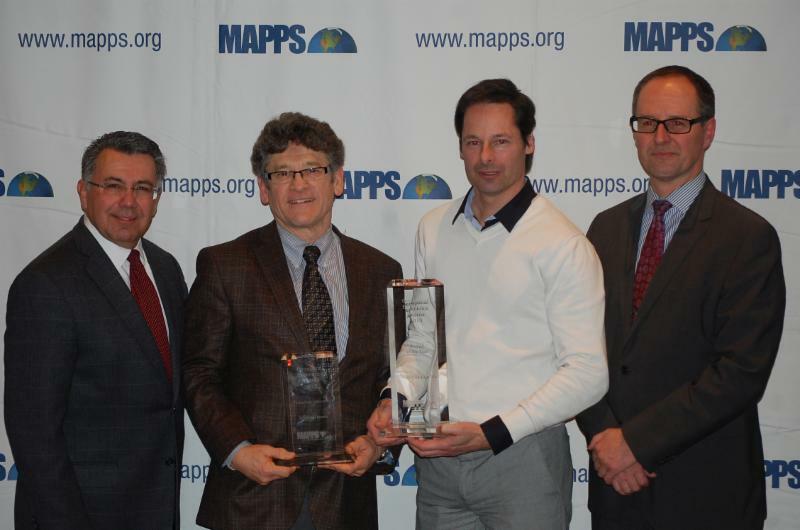 MAPPS also honored winners in six technical categories. Woolpert (Dayton, OH) was selected in the Photogrammetry/Elevation Data Generation category with the Little Bighorn Battlefield National Monument Headstone Mapping Project that utilized LiDAR to locate and map 4,320 headstones and 280 battlefield markers. The winning project in the Remote Sensing category was by Aerial Services, Inc. (Cedar Falls, IA) for the project, The Race for Now: Maximizing Crop Yields Using Innovations in Remote Sensing, which acquired imagery using multiple sensors during the critical growing phases to produce a web-based precision agriculture service in the State of Iowa. In the GIS/IT category, Merrick & Company (Greenwood Village, CO) was selected for GIS Models Visualize Ancient Flooding Problems in the country of Columbia. As project manager, Merrick provided technology transfer and GIS data and training, and introduced a new methodology, "monotonicity", which guarantees that acoustic bathymetry, LiDAR and breaklines are correctly integrated. The winner in the Surveying/Field Data Collection category was the Baltimore, MD office of AECOM for a project, Protocol for Determining Grass Channel Credits. Using GIS, LiDAR and aerial imagery, AECOM worked with the Maryland State Highway Administration to identify roadway ditches to assure compliance with the Department of the Environment grass channel treatment criteria. TerraSond (Palmer, AK) earned the award in the Small Projects category for the Bradley Lake Hydro Power project. TerraSond teamed to perform an inspection of a diversion tunnel to a dam and power tunnel inlet in Homer, Alaska to identify the quantity of debris that was covering the inlet screen by comparing the debris profile with the as-built drawings to determine the amount of debris that needed to be removed. Teledyne Optech's Multi-spectral LiDAR Sensor: ALTM Titan also won in the Technology Innovation category. A panel of independent judges evaluated projects submitted by MAPPS members for the awards program. Joining Mr. Burtch on the panel was Michael Anderson, Editor of POB, The Honorable Doug Domenech, former Secretary of Natural Resources for the Commonwealth of Virginia; Donn Dears, author of the recently published book Nothing to Fear: A Bright Future for Fossil Fuels, Leonard C. Gilroy, Director of Government Reform at Reason Foundation; and Neil Sandler, Publisher of xyHt.